“Why do I need drugs, will it really help me?” This is the question that one should ask before falling into the trap of drug addiction. 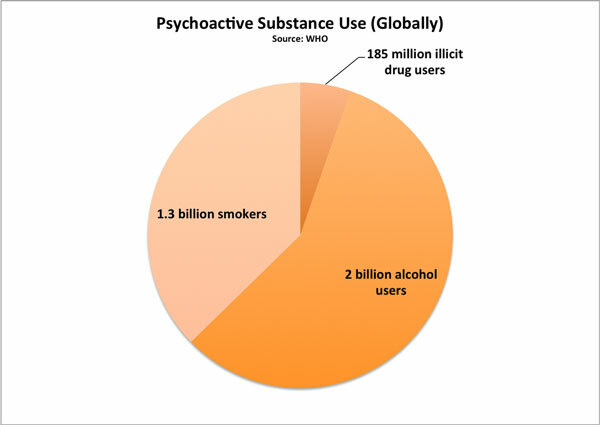 Do you know the estimate of drug users worldwide is how much? You would be alarmed to know that it’s 185 million! Drug and substance abuse is a potential threat to the physical, psychological, socio-economic fabric of families and individuals. 1) What is a drug? 2) What are the psychological effects of drugs? 3) What leads to drug addiction? 4) How to deal with drug addiction problems? A drug is any substance that can alter the physiological and psychological functioning of an individual. Drug addiction has adverse effects on the central nervous system of a human being. It also affects other parts of the body too. Due to this, the vital functions like perception, thinking, concentration, attention, memory and behavior of a person gets seriously impaired or affected. There are many causes actually. Some common causes are: Situational factors, family environment in which some or the other person abuses drugs, peer pressure, faulty coping to the stressors and pressures of life, social learning and modeling, media influence and so on. Present day medical and clinical methods offer a wide variety of ways through which drug addiction can be treated. The best way is to opt for both pharmacological and psychological treatment. This will help you get over the problem and also aid to prevention of relapse. So that was a brief sketch on drug addiction and its effects. If you or any one of your near ones are in the threshold of it or are suffering from it, then without any delay please try to seek medical/psychological assistance to get rid of it. I remember while I was working in an observation home, I saw cut multiple cut marks in the hands of its inmates. You won’t believe the age of those inmates was below 16. These children cut their hands with blades and used drugs in the cuts to induce toxication. In our society, manifold forms of drug abuse are used. But, what is the final result…drudgery and death? Is that really worth? Drug addiction may give pleasure or solace for a moment, but its ill-effects on the body, mind, and society…are hellish. For whatever reasons one may get attracted and addicted towards drugs, finally it is going to take a toll on him/her one day. So as civilized and responsible citizens of the society we should try to save others and ourselves from the clutches of drug addiction. Wish you a drug-free and addiction-free life ahead!